All players who will be 18 years old on or before September 15 and not older than 20 years old before December 31 of the draft year are eligible for selection for that year’s NHL Entry Draft. In addition, non-North American players over the age of 20 are eligible. “On or before” – that first one is the key for Ice Dogs forward Oliver Castleman. Born on September 15th, had Castleman been born a few hours later, he wouldn’t be eligible until next summer’s draft. As a result, he will enter this June’s draft nearly an entire year younger than some of his peers. For reference, top prospect Nolan Patrick was born 361 days earlier than Castleman. Ranked 164th among North American skaters, there is a very good chance Castleman doesn’t get drafted this year – though I find it hard to believe that will happen. Someone will take a flier on him as a project in the second half of the draft, and they’ll likely end up very glad they did. 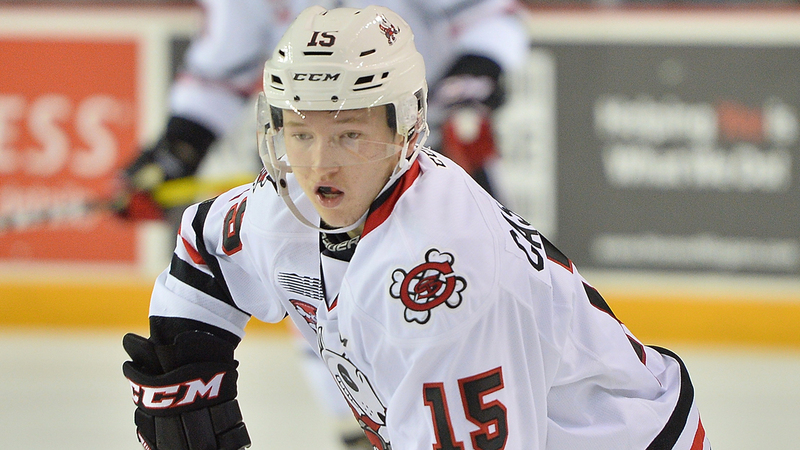 After being passed over in 2015, the Ice Dogs picked Castleman as a re-entry in the 4th round of the 2016 OHL Priority Selection draft. As a result, he joined Niagara more physically mature than most rookies. He is a skilled forward who isn’t afraid to play with a tenacious edge to his game. Playing mostly in the middle-6 position of a young Ice Dogs team, Castleman was able to provide secondary scoring while being versatile enough to move up and down the lineup. Playing mostly on the wing this season, Castleman made the most of the opportunity he was given. Sixteen of his 18 goals were scored at 5 on 5, putting him 15th among draft eligible OHLers ahead of possible first rounders like Robert Thomas, Morgan Frost and Alex Forementon. Castleman plays a very smart and composed game for someone his age – playing aggressively but with the discipline that allowed him to make it through the season with only 20 penalty minutes. As with most young hockey players he’s got work to do away from the puck. Despite finishing fifth on Niagara in scoring, he had a negative goal-for percentage relative to his teammates. He’s a good forechecker with a quick release and an underrated ability to create his own scoring chances. Next season will be a big one as the Ice Dogs will needs him to be the secondary scoring option behind Akil Thomas. I expect his point total to climb significantly and if he were a few days younger, he’d likely have lot more buzz as a 2018 draft prospect. To quote Masai Ujiri, he might be two years away from being two years away, but something tells me Oliver Castleman will be worth the wait.